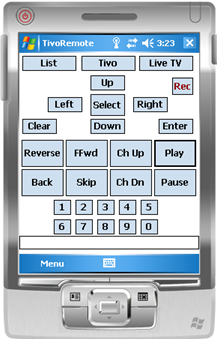 PPCTivoRemote is an application that runs on a PocketPC to simulate a Tivo Remote Control using a WiFi connection to TivoWeb which already has support for an emulated remote control via the sendkey module. This is a great way to control your Tivo if your real remote control does not work (like when I fried my Tivo's IR sensor). This includes source code in C# (Visual Studio) and includes both the mobile app and a Web Service that talks to the Tivo (you could combine these into one - I needed both). DisplayText is a TivoWeb module that will display text on the Tivo screen. Text to be displayed may be entered inteactively from a PC web browser as shown in the screen shot below. PPCTivoRemote Visual Studio 2005 projects for mobile app and web service. Cwingert's newtext2osd V1.4 required program. V1.2 Use cwingert's newtext2osd V1.4. There is no new functionality so if you are happy with the previous version(s), there is no need to upgrade. However, if you like to stay current with the latest versions, use this itcl file and download newtext2osd V1.4 using the above link. V1.1 Use cwingert's newtxt2osd program instead of newtext2osd to take advantage of a better font that correctly displays descending characters. Note: background text color 0 is transparent but the default is 1, gray, for better visibility.